This website is operated by Capital 101.7fm. Your use of this web site, including any of the content or materials on it is governed by these terms and conditions. In addition to these terms, there may also be additional terms that govern your use of or access to specific parts or sections of this website in which case those specific terms will apply to your activities at those locations in addition	to these terms. Subject to any responsibilities implied by law that cannot be excluded, neither this site or Capital 101.7fm is liable to you for any loss, damage, claims, liabilities, expenses (including without limitation legal costs and settlement costs) whatsoever arising out of or attributable to any content, services or other material on this website whether in contract, tort (including negligence), statute or otherwise. 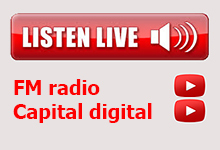 The information contained in this Website is only to be displayed in full screen format (not framed) unless permission has been obtained from Capital 101.7fm. No liability is accepted for any information or services that may appear in any other format. As a general principle, Capital 101.7fm encourages links to its websites, however it reserves the right to bar links in the event that they are provided in a manner which is incompatible with the workings of a democratic, diverse and tolerant community or if it considers, in its absolute discretion, that any link is inappropriate.